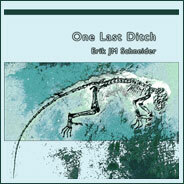 One Last Ditch: buy it, read it! What’s been said about One Last Ditch so far? what an opening. heartbreaking and energizing— and strange. I am hooked. Given that she does not know me, I can only conclude that she was saying this in reference to One Last Ditch , a copy of which Lyn had just sent her. You may order a copy of your very own using PayPal, if you live in the US, by sending $20SD per copy and your shipping address to onelastditch@gmail.com, or you may email me there for alternate arrangements if you are outside the US or need a particularly large number of copies–I do offer discounts on shipping for large orders. After I run out of copies, I will be directing you to the distributor, but for now, I have many many many of these things to get rid of. Please help! One Last Ditch is being graciously published by the Atelos publishing project. Atelos was founded in 1995 as a project of Hip’s Road and is devoted to publishing, under the sign of poetry, writing that challenges conventional, limiting definitions of poetry. All the works published as part of the Atelos project are commissioned specifically for it, and each is involved in some way with crossing traditional genre boundaries, including, for example, those that would separate theory from practice, poetry from prose, essay from drama, the visual image from the verbal, the literary from the nonliterary, and so forth. The project directors and editors are Lyn Hejinian and Travis Ortiz. The director for text production and design is Travis Ortiz; the director for cover production and design is Ree Katrak.